1. Bring large pot of water to boil. Salt water and cook pasta until al dente (as per directions on the packet). 2. 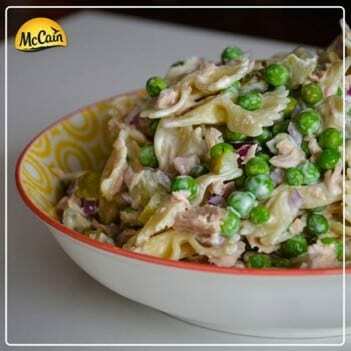 Stir in McCain Frozen Peas and cook for a further 30 seconds. Drain pasta and peas. If you want room temperature pasta salad, don't rinse. If you want cold pasta salad, rinse with cold water. In a large bowl, stir cooked pasta and peas together with remaining ingredients until everything is evenly coated in mayonnaise and lemon juice. Serve or refrigerate covered until ready to serve. 1 Bring large pot of water to boil. Salt water and cook pasta until al dente (as per directions on the packet). 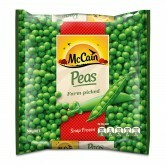 2 Stir in McCain Frozen Peas and cook for a further 30 seconds. Drain pasta and peas. If you want room temperature pasta salad, don't rinse. If you want cold pasta salad, rinse with cold water. In a large bowl, stir cooked pasta and peas together with remaining ingredients until everything is evenly coated in mayonnaise and lemon juice. Serve or refrigerate covered until ready to serve.